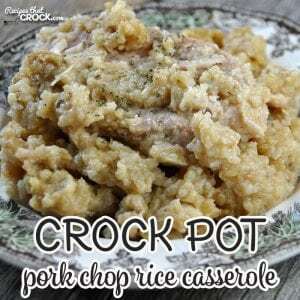 Crock Pot Pork Chop Rice Casserole - Recipes That Crock! 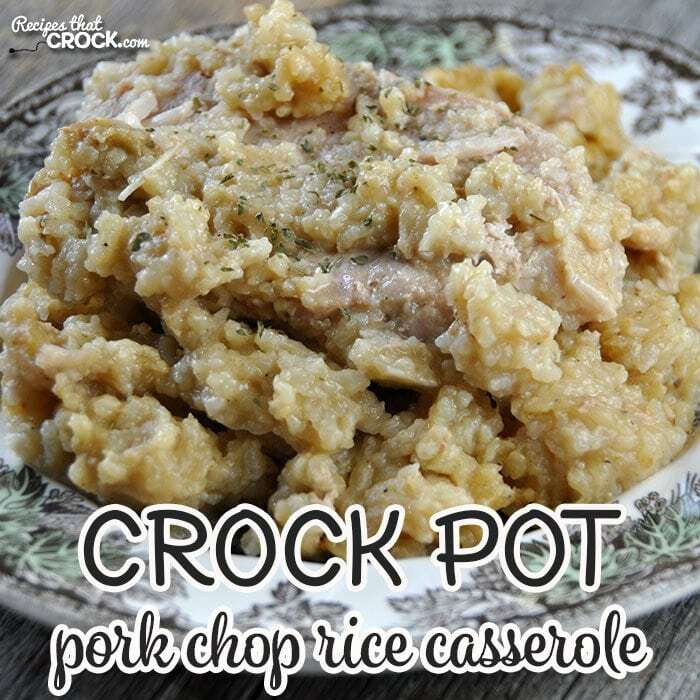 If comfort food is what you want, then you don’t want to miss this delicious Crock Pot Pork Chop Rice Casserole! It is super easy and deeelicious! We love rice recipes around here. There’s just something about pork or chicken cooked up with some yummy rice in a creamy sauce. Yum! Make sure you use long-grain, long cooking rice for this, not minute rice. An easy way to tell is to look at the cooking instructions on the package. The instructions on the right package will tell you to bring the water to a boil and let it simmer for at least 15 minutes, NOT the package that says you can be done in 5 minutes in the microwave. If you do NOT like the softness of rice in a casserole dish, this may not be the recipe for you. We like it that way, so I did not try it with less liquid. I will tell you that this recipe has amazing flavor. So if you like a good chicken rice or pork chop rice casserole, then you are in for a treat! This is a rice recipe, so knowing your slow cooker is a must. I can’t tell you enough how important this is! If your crock pot doesn’t cook evenly or cooks too hot or cooks too slow, it can ruin a recipe with rice in it. That is why I used Sir Hamilton (my insulated Hamilton Beach slow cooker). He is a 6-quart slow cooker, so that gives the recipe enough room to spread out. He cooks perfectly and evenly, so I know that I am not going to have hot spots that turn the rice to mush or slower cooking spots that leave me with crunchy rice. This is not a recipe to try out on your new crock. Use your tried and true, favorite crock pot that you know cooks evenly. 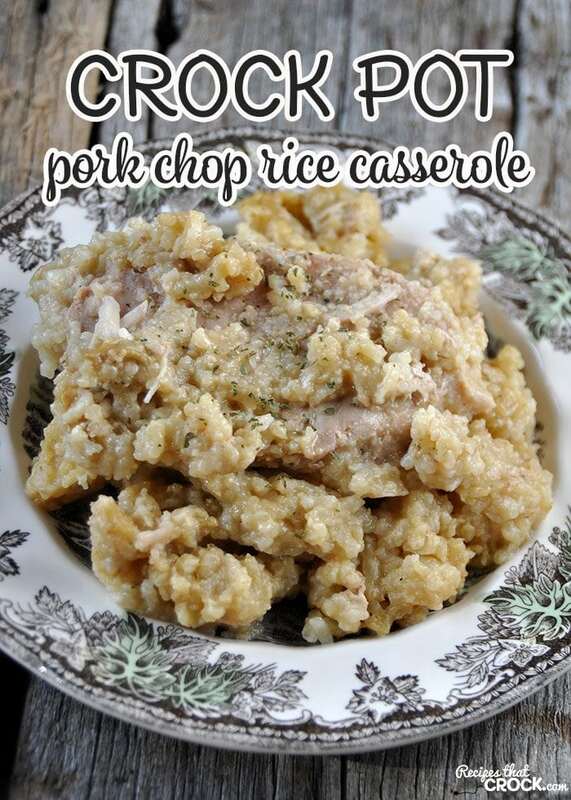 This Crock Pot Pork Chop Rice Casserole is comfort food at its best! Place chops evenly on the bottom of the crock. Stir together remaining ingredients until blended well. Spread over top of chops. Mom & I love pork chops but for some reason, mom says they are always kind of dry. I don’t expect that will be the problem with this recipe. Do you think it would make a difference if you used Cream of Mushroom soup in a box? It’s a natural soup and it is so yummy. I don’t mind using the other kind of soup but my sisters have a cow when I do and I would like them to taste this. I can’t wait to try this! Even though I haven’t tried this yet, I can tell just by reading it that it will be a 5 star, which is why I rated it that. I have never made this with cream of mushroom soup in a box. If you give it a try, let me know how it goes! Enjoy! I have not tried it with this recipe, but Cris uses a onion soup mix in her Crock Pot Chicken and Herbed Rice, which is what this recipe was based on. So I think it would work. Let me know how it goes! Enjoy! Can you use 1pkg onion soup mix or must you use the dip mix only? What is “long cooking” rice as opposed to regular rice? Or did you mean just not instant? A good way to tell it is long cooking is to look at the cooking instructions on the package. You want the package that tells you to bring the water to a boil and let it simmer for at least 15 minutes, NOT the package that says you can be done in 5 minutes in the microwave. Enjoy! Cooking rice in the crock pot can be tricky business! Believe me, I have had many trial and errors when testing out recipes! Here are a few of the things I have learned…If all of your rice is crunchy, then you know that your crock pot doesn’t cook as hot, so you will need to extend the cooking time a bit. If you have some crunchy, some mushy rice, then you know your crock pot has some hot spots, which means you will either want to use a different crock pot, or if that is not an option, you will want to rotate your crock or insert a few times. If your rice is mushy, that means your crock pot cooks hot, so you will need to check it often to see how fast it is cooking. For all these instances, you will want to keep a very close eye on it the first time you make the recipe. If not, then disaster could easily happen. This recipe has amazing flavor, so I hope you will give a try with great success! Enjoy! Can brown rice be substituted and if so, what changes in liquid would you make? I have not tried it, but if I were to try it, I would use 1 cup of brown rice with an additional 1/4 cup of water. If you give it a try, let me know how it goes! Enjoy! Bet u could do this with chicken as well! You are correct! I actually based this recipe off of the Crock Pot Chicken and Herbed Rice recipe Cris did a while back…with a few changes, of course. 🙂 Enjoy! I have never tried it! If you do, let me know how it turns out! Enjoy!